Phallus hadriani, the Dune Stinkhorn, emerges from an 'egg' beneath the surface. The cap is initially covered with olive-green 'gleba', a smelly coating that attracts insects which in turn distribute the spores. In Britain this is a rare species and almost exclusively restricted to sand dunes. 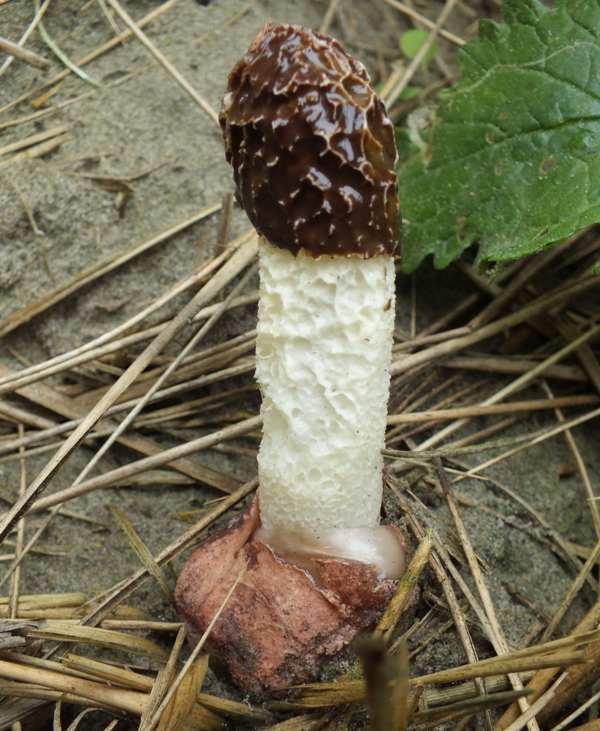 A violet volva distinguishes the Dune Stinkhorn from the much more common Stinkhorn, Phallus impudicus, which has a white volva but in other macroscopic characteristics is much the same. 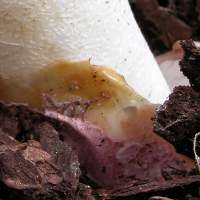 Even at the egg stage, a pinkish tinge differentiates the Dune Stinkhorn from the more common and widespread Stinkhorn Phallus impudicus, which has a white volva. 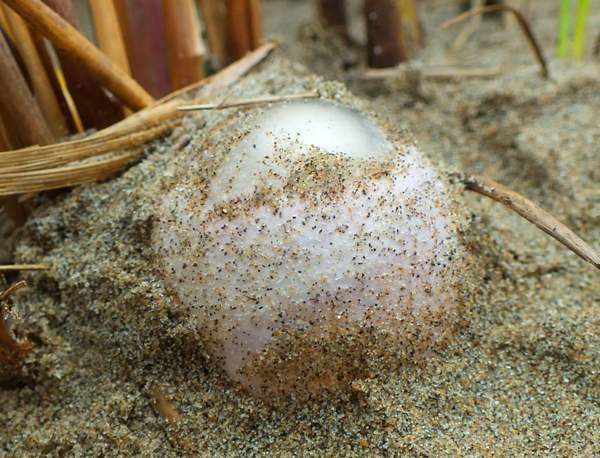 The Dune Stinkhorn egg seen below was found in a coastal location in West Wales. Rather a rare find in Britain and Ireland, where it is largely confined to coastal sand dunes, Phallus hadriani also occurs in coastal zones and some dry inland regions of other countries in Europe, from Scandinavia to the southernmost parts of the Iberian Peninsula and the shores of the Mediterranean. This species is also found in parts of Asia and North America. The Dune Stinkhorn is thought to be an introduced species in Australia. The Dune Stinkhorn, Phallus hadriani, was described in 1798 by French botanist Étienne Pierre Ventenat (1757 - 1808), who gave it the scientific name Phallus hadriani (a binomial name that was subsequently sanctioned by Christiaan Hendrik Persoon in his Synopsis Methodica Fungorum of 1801). Synonyms of Phallus hadriani include Phallus iosmus Berk., Hymenophallus hadriani (Vent.) Nees, and Phallus imperialis Schulzer. The genus name Phallus was chosen by Carl Linnaeus, and it is a reference to the phallic appearance of many of the fruitbodies within this fungal group. The specific epithet hadriani is named in honour of Dutch botanist Hadrianus Junius (1512 - 1575) who, in 1564, wrote a pamphlet about stinkhorn fungi. 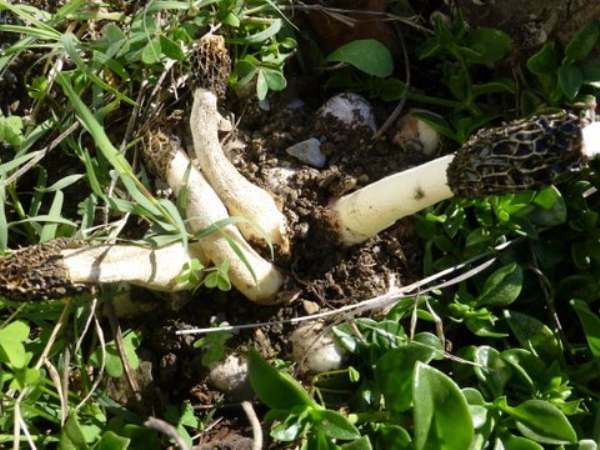 The vile smell of most mature stinkhorn fungi, and certainly Phallus hadriani, might be taken to suggest that these fungi are toxic or at least inedible; however, some people do eat them, but only at the 'egg' stage when the odour is not so evident. That said, I have heard of no instances of turf wars (or sand dune wars) over the rights to gather these edible but hardly delectable fungi. When fully mature, Dune Stinkhorns are greatly valued as a source of food... by flies! 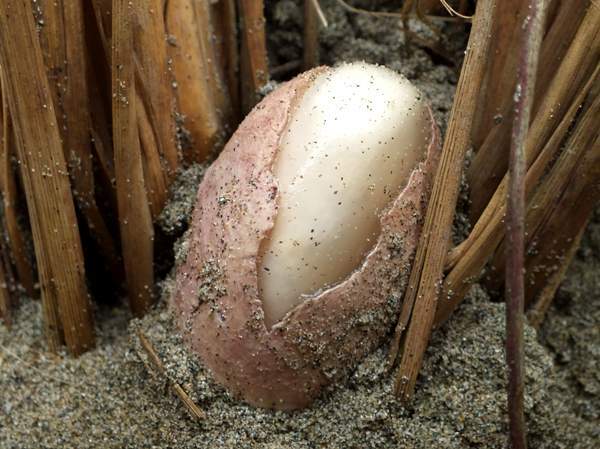 The 'egg' from which the Dune Stinkhorn emerges is typically 4 to 6cm in diameter, gradually vertically becoming elongated until it ruptures and the stem emerges quickly (usually taking little more than an hour to reach its maximum height), bearing the gleba-coated cap aloft. 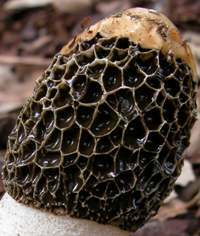 Beneath the sticky olive-green gleba coating, the cap of the Dune Stinkhorn has a raised honeycomb structure. 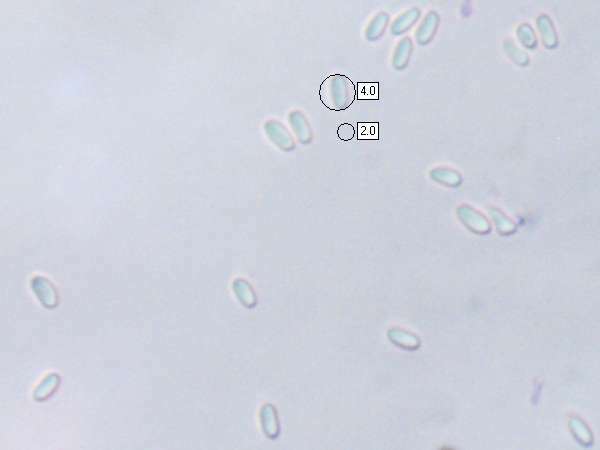 This is all that many people ever see of the cap of this fungus because insects very quickly eat the spore-bearing gleba, at the same time getting some of it stuck to their legs so that spores are transported over quite large distances as the insects fly off in search of food elsewhere. These stinkhorns range from 10 to 18cm tall; stipe diameter is 2 to 3.5cm; the caps vary from 2.5 to 4.5cm across. The stem is white and looks like expanded polystyrene, and it emerges from the remains of a violet-coloured universal veil that covered the fruitbody at the egg stage and ultimately remains around the base of the stem like a bag. After the gleba has been consumed by insects, the white stipes can persist for several days, and so you can expect to see many more Dune Stinkhorns with white caps than with olive green ones. 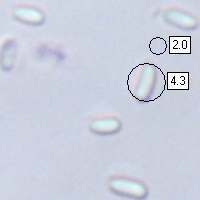 Oblong-ellipsoidal, smooth, 3-4.5 x 1.5-2.5µm. A strong, unpleasant odour; no distinctive taste. 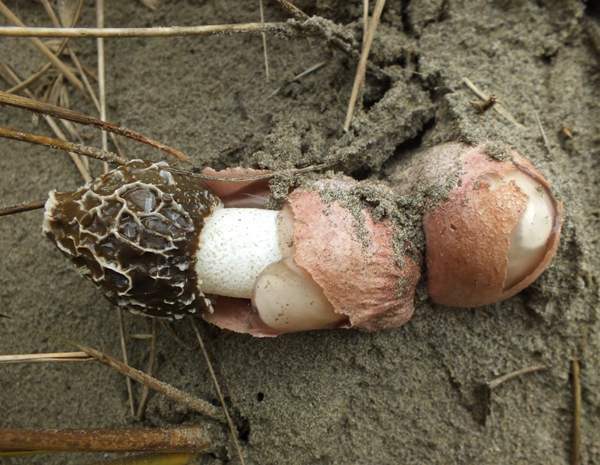 In Britain and Ireland the Dune Stinkhorn is confined almost exclusively to sand dunes, but in many other countries it occurs also in dry inland habitats. Phallus impudicus, the Stinkhorn, has a white volva and is typically somewhat taller than the Dune Stinkhorn. The picture shown above was kindly contributed by Katherine Paterson and shows a large group of stinkhorns and several more eggs yet to 'hatch' (species not determined) in Andalucia, southern Spain. Persoon C H (1801). Systema Methodica Fungorum. Göttingen: Apud H. Dieterich. p. 246. Pegler, D N, Laessoe, T & Spooner, B M (1995). British Puffballs, Earthstars and Stinkhorns. Royal Botanic Gardens, Kew.